We have a lovely newly renovated two Bedroom (with a loft), waterfront cottage available for you to enjoy. Hardwood floors, stainless steel appliances, new furnishings and so much more! A quiet setting for fishing, swimming, golfing (golf course only a 3 minute drive) in the summer. In the fall, enjoy the beautiful foliage & hiking trails and in the winter take advantage of ice fishing, skiing (20 minutes to the closet ski resort) or take a ride on a snowmobile on the ice. Beautiful, newly updated, FOUR season cottage. Lovely waterfront location that is convenient to Manchester, NH and Concord, NH. Waterfront Dock Fire pit Outside seating Quiet Close to cities Clean! Newly updated bathroom with shower. Also, a stackable washer/dryer combo. Enjoy our keurig and complimentary pods! Pots, pans, anything you need for cooking! Newly updated kitchen offers all stainless steel appliances. We have a 24" flatscreen TV in the main living area. It does not have cable, however a ROKU for streaming video. Pats Peak is a short 25 minute drive. Other larger ski resorts 50 minutes away. Beautiful golf club only 5 minutes away! We enjoyed our stay at the cottage. We loved staying at this lovely cottage! We have been lucky enough to have stayed here twice within the past few weeks. Krista is so easy to get in touch with and she is very accommodating! She has everything you need at the house and not to worry if you forgot a few toiletries because she has extras!! The house is super clean and neat -very important to me because I am a bit of a "clean freak!" It's a great spot on a lake- our kids enjoyed watching the ice fisherman and definitely playing in the snow in the back yard. If you are looking for a great place to stay this is it!!! Cozy house nestled in a quiet area of Southern New Hampshire. Lake access with good degree of privacy but only a short drive from activities in some of larger towns. Will look to return! We absolutely loved our stay! Krista and Greg really go above and beyond to make you feel right at home. It was the perfect place for my husband and I to relax for a long weekend. The weather wasn't kind to us for a good portion of the weekend, so we got to enjoy the many wonderful items that Krista and Greg make available in their home; a Bose Bluetooth Speaker, a fun collection of games and a Roku for streaming shows and movies; all while enjoying the beautiful view of the lake through the wall of windows in the main living area. A break in the weather came and we took advantage of the hiking trails located right there in the neighborhood. Kuncanowet Town Forest has a great mix of trails, some for the less adventurous hiker (like me) and many other trails for the more experienced. The location of the home is great. Located a short 10 minute drive to the nearby small town of Goffstown, yet far enough away to get that secluded woodsy feel that we were looking for. The gorgeous backdrop of the lake and the mountain across was a HUGE bonus! Gorgeous! Krista was responsive, attentive, kind and very easy to coordinate with. We highly recommend a visit to their beautiful home! Can't thank you enough for sharing your beautiful home with us! This was a perfect spot to base our vacation. 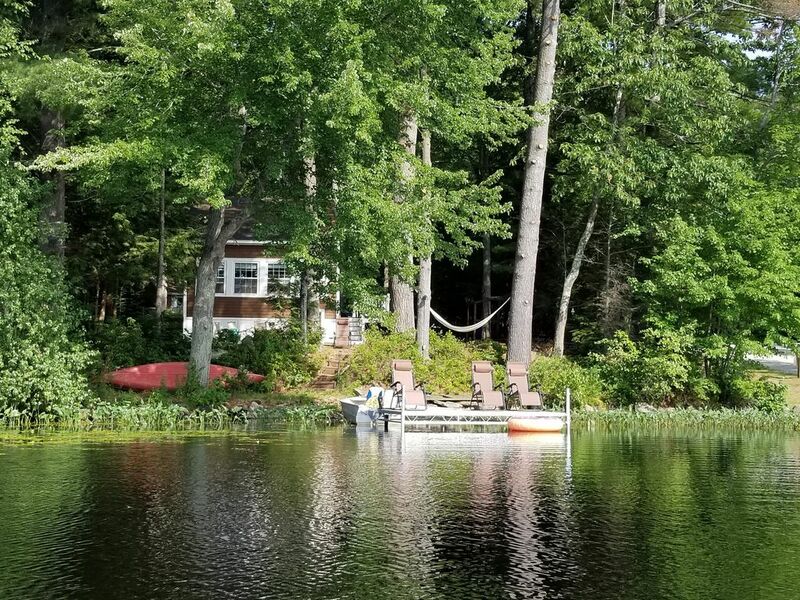 Lake views, canoeing and quaint N.E. scenery were great. A conveient location for photography trips to the White Mtn area, the lakes region and local covered bridge exploring. Clean, charming and well appointed lakefront cabin. Thanks John! We are very happy you enjoyed and hope you visit beautiful NH again soon! About 15 minutes to Goffstown, NH - 25 mins to Concord or Manchester, NH.